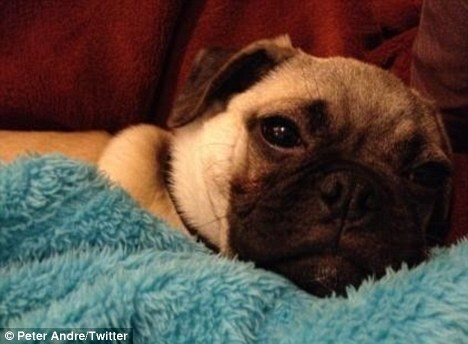 Mysterious Girl singer and TV star Peter Andre posted a photo of his new pet pug on Twitter last night: ‘Welcome Charlie Pug :))) we love him . He is a dude’. Charlie Pug was a rescue dog from Battersea, ’The other owners were apparently very good but had to move overseas I’m sure he was really loved by them too. One of us already’. Rabbit thinks that Charlie is really lucky to join Peter’s family and that he is setting a great example by getting a rescue dog. We’re looking forward to seeing many more pics of Charlie Pug from Peter’s Twitter page soon.